Happy Monday! I’m excited to share another free crochet pattern with you! They work pretty well too! I can only wear them a couple days before they need to be washed again. So far they’ve been washed several times and are holding up great. The purpose of these slippers is to sweep your floors as you’re walking around. Please be extra careful while wearing these around your house on slick floors/stairs so that you don’t slip and fall! I haven’t slipped round much as I have been wearing these non-stop, but it is better to be safe than sorry. If you choose to use a different kind of yarn, be sure that it is washable. Since you will be cleaning your floors with these you will want to make sure they will hold up wash after wash! I chose wool items for the moisture wicking properties that wool naturally offers. Slippers are one size fits most. I wear a US women’s 6.5 and they are nice and roomy. My husband wears a US Men’s 10.5 and they stretched to fit his feet. The nice thing about crochet is that your slippers will stretch. Or you can customize these to your feet by adding/subtracting a couple extra rows (length) or a couple extra stitches (width) in a row! Single Crochet and Loop Stitch. See https://www.youtube.com/watch?v=iuR0OlDqH0g for a tutorial on how to do the loop stitch. Combine both yarns and chain 5. Row 24: Sc around the edge of the sole, join with a slip stitch, fasten off and weave in the ends. Join to the other side of the slipper upper using a slip stitch. Sc around the outside of the of the slipper upper, join with a slip stitch and fasten off. Stitch slipper sole and slipper upper together using a whip stitch. Once you’ve stitched them together, fasten off and weave in the ends. To give your slippers a polished look, join yarn, Sc around the foot opening, join with a slip stitch, fasten off and weave in the ends. Welcome to WIP Wednesday y'all! My idea is for this to be a weekly roundup of my works in progress. #getit #wip #wipitgood I hope you enjoy! After the New Year, I sat down and wrote out a list of aspirations, not resolutions. #hatethose It hit me that I'd rather be an artisan than a factory. From there, my mind started racing about things I'd like to design and write patterns for. #inspofordayz I have so many ideas and I can't wait to share them with you! 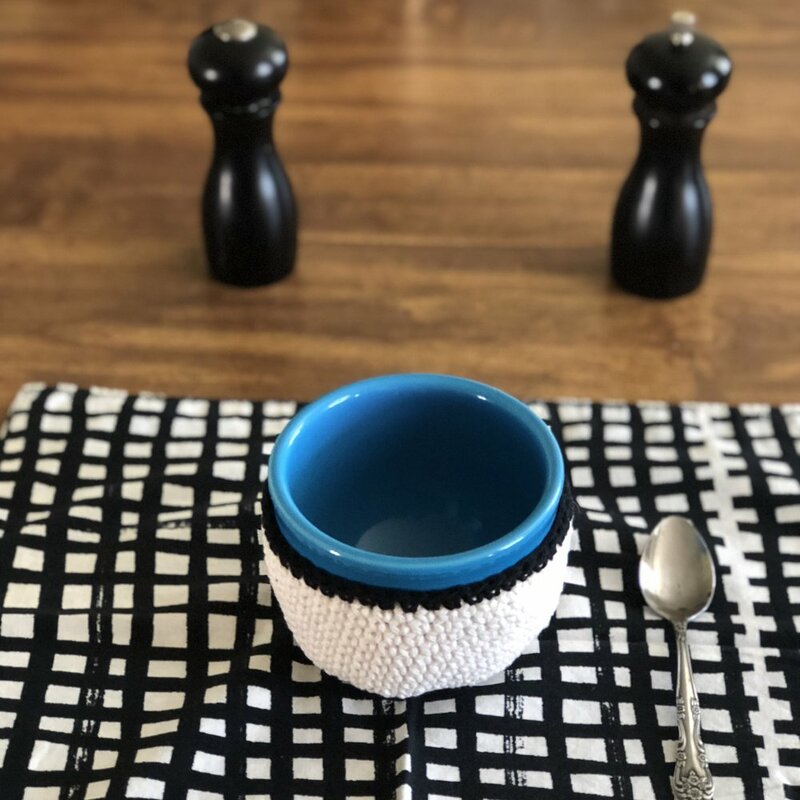 Next up on my design list was soup bowl cozies. We've been enjoying lots of soups and chili this winter while we watch tv. It though it would be nice to have a cozy for my soup bowl to help keep it warm and protect my hands from a hot soup bowl. Lastly, the third pattern I'm working on right now is Cabled Fingerless Gloves. I designed these to match a hat I made for my mother-in-law at Christmas. Since it seems that warm weather is upon us, I probably won't post this pattern until next fall when people start making cold weather items again. I've got some ideas for spring and summer patterns but haven't flushed them out or started working on them yet. More to come next WIP Wednesday!